Home / CRUISING THE PAST / CRUISING TODAY. 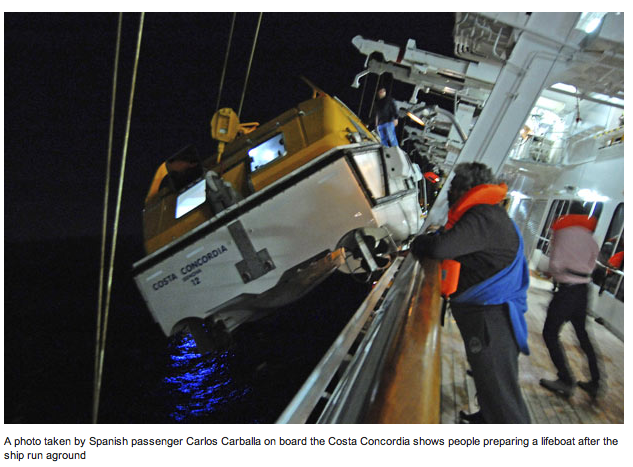 CARNIVAL CORP’S PR SPIN GOES AFTER COSTA CONCORDIA CAPTAIN TO DOWNPLAY DANGER OF MEGASHIPS. People look at the stricken Carnival Corp Costa Cruises ship . The media has jumped on the bandwagon to create as much commotion as possible and thus hide the key issues in this tragedy. 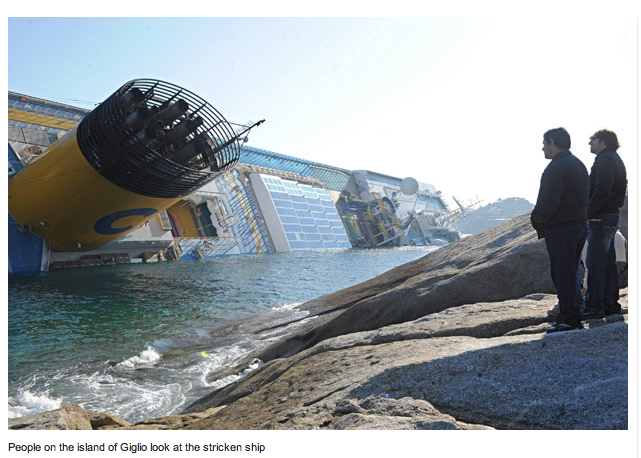 Captain Schettino is now accused by the vox populi of abandoning ship. I do not believe this is so. The captain left the bridge when the ship was listing at such an angle that it was almost impossible to move within its confines. At that point, more than 90% of the people aboard (passengers and crew) had been evacuated. The listing finally reached an angle of about 70 degrees. I believe Captain Schettino was much more effective commanding operations from a launch, than from a semi-capsized vessel. The real culprits (the ship builders and the cruise line management) will now try to destroy Captain Schettino to hide their own ineptitudes. I believe this is the reason for the smear campaign against the ship’s captain. The real issue in this tragedy, however, is faulty hull design. I was on the Queen Victoria last year…Trans-Atlantic in January from Southampton to New York. If the Concordia incident had happened aboard the QV in the rough seas we faced on the crossing – a Cunard Line (Carnival owned) Queen Victoria disaster would have made the Titanic look like child’s play. The Costa Concordia disaster must serve as a warning. If the hull of a modern cruise ship (especially the megaships) is damaged, the ship runs the risk of quickly losing stability and capsizing. If this happens to one of the megaships in the high seas, we will not have 30 or so casualties, as with the Costa Concordia, we will have hundreds or possibly even thousands who will be trapped aboard the capsized vessel. This issue must be addressed immediately. The hull designs of the cruise ships now being built must be revised. The hulls of existing cruise ships must be improved. Recent update: The captain of Carnival Corp’s Costa Concordia slowed the ship down so that he could enjoy dinner with a Moldovan ex-dancer and then speeded up as he approached the island of Giglio in order to make up time, prosecutors alleged today. Problems lowering the lifeboats taken by Spanish passenger. In high seas this would have been manslaughter when thousands would have been trapped aboard. By the time the luxury liner came close to Giglio it was traveling at 16 knots, despite being in shallow water and dangerously near to the island’s rocky shore. Several passengers have said they witnessed Capt Francesco Schettino having dinner on the night of the disaster with Domnica Cemortan, a blonde Moldovan who had worked as a passenger rep on the ship and as a dancer on other cruise vessels. 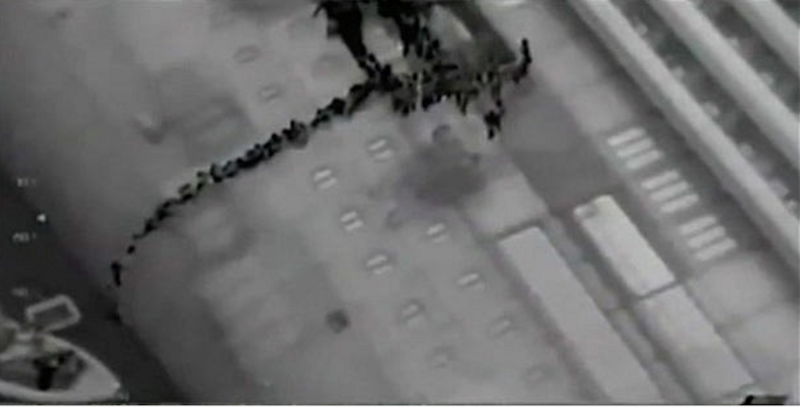 Passengers had to crawl down side of ship to get off. Imagine this happening in high seas. The captain “slowed down the ship so that he could finish dinner in peace”, just prior to sailing close to Giglio in order to perform a ‘salute’ to an old colleague on the island, prosecutors alleged in a report. He then ordered the ship’s speed to be increased to 16 knots “despite the proximity of obstacles, the presence of shallow water, the conditions under which the ship had to maneuver and the night-time darkness,” prosecutors charged. As a result of the increased speed he was unable to maintain “an adequate distance” between the ship and the island.